Alison Bechdel and Joe Sacco decided to write about their state in graphic form, and they had different styles of conveying the quirks of the state. Joe Sacco spoke mainly about his personal life, even going into his relationship with his girlfriend. Alison Bechdel made Vermont seem very unique with its rugged individualism and connection with nature. Since she went into the most detail about the state’s people, politics, and geography, and because she offered an insight into the State’s character affecting her own, Bechdel was more successful in her depiction of Vermont. Anthony Doerr, the author of Idaho’s essay, is an accomplished author of books such as The Shell Collector, About Grace, Seasons in Rome, and recently, Memory Wall. His books have been twice a New York Times Notable Book and once an American Library Association Book of the Year. Doerr also is the author of many short stories, which have won the Rome Prize, four O. Henry prizes, and several others. He also has a column in The Boston Globe and less often writes Op-Eds for The New York Times. In Doerr’s career he has developed an interest for science and the natural world. He frequently writes about nature and reviews scientific books. Doerr has also worked and lived in both Africa and New Zealand where many of his stories take place. He is now residing in Boise, Idaho with his wife and two sons. 1996, he wrote and illustrated the famous American award-winning book “Palestine”. Joe Sacco currently resides in Portland, Oregon. 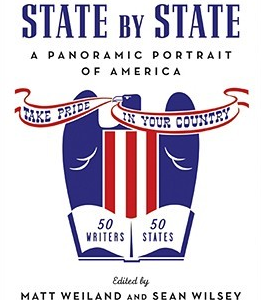 When Sacco wrote his story, he divulged both his passion for the state and the state itself. His focus, preferring anecdotal to panoramic, excavates details that infrequently make it to the news or the history books. For example, in Oregon, it rains a lot. It’s rather simple to just say, “Oregon is a beautiful country and it rains a lot”. But the way he tells us that it rains a lot is more indirect. He gives many examples, implying constant showers. For example, Sacco tells us that there is a place that’s full of peril called the Pearl District. He uses an umbrella to protect himself from being jumped. And when he has to walk his awful embarrassing creature, the dog, he sometimes waits 20 minutes when there are clouds in the sky. Sacco also dislikes the heat. And when it’s too hot, his wife, Amalie, would want her tomatoes to receive hard heat for anther five or six days. Sacco thinks that it is unquestionably essential for a good writer to travel in various places and it is also ideal for him to visualize something when he’s walking around.